NASA has reestablished contact with the International Space Station Tuesday (Feb. 19) nearly three hours after an equipment failure left the orbiting laboratory dependent without a direct link to its Mission Control center, space agency officials said. Space station flight controllers at NASA's Mission Control center in Houston restored contact with the space station at 12:34 p.m. ET (17:34 GMT), according to an update. The space agency lost communication with the International Space Station at 9:45 a.m. ET (1445 GMT). "Flight controllers were in the process of updating the station’s command and control software and were transitioning from the primary computer to the backup computer to complete the software load when the loss of communication occurred," NASA officials said in a statement. 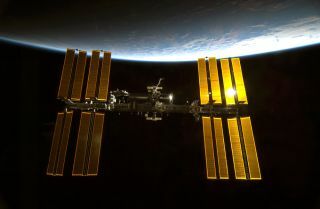 The communications loss occurred as flight controllers at NASA's Mission Control at the Johnson Space Center in Houston were sending a software update to the space station. The space station is currently home to three Russians, two Americans and a Canadian astronaut. NASA flight controllers were able to communicate with the spaceflyers aboard the space station before lines of communication were reestablished. This is not the first time Mission Control has lost direct communication with the orbiting science laboratory. In 2010, the space station briefly lost communication with the ground when a primary computer failed and the backup had to take over. Communications were out for about one hour before NASA restored the connection. The International Space Station is a $100 billion laboratory in space that is about the size of a football field. It has the living space equivalent of a five-bedroom home and was built by five different space agencies representing the United States, Russia, Europe, Canada and Japan.